After a long night’s rest, you expect to rise feeling refreshed, ready to take on the new day. It can be a real downer waking up with back pain. My back hurts after sleeping! Why? The most common cause of sleep-related back pain is poor sleep posture. Thankfully it’s often simple to correct. 1. You’re just sleeping wrong! We sleep 1/3 of our lives away. With that much practice you’d think we’d all be great sleepers. Unfortunately not all of us are getting the best rest we can get. When you climb into bed, you might initially feel comfortable, but after you drift off, your sleep position can inadvertently put unnecessary stress on your back. Your spine is best off when it’s straight. It’s simple: unnatural bends and twists in your back can cause muscle strains and put pressure on nerves and discs. Keep your back straight and you’ll potentially eliminate your back pain. Stomach sleeping is notorious for causing lower back pain. In most cases stomach sleeping will cause your upper body to arch upwards. Hello, pain! It’s a good bet that this is the root of your problem; try to acclimate to a different sleeping position. Rolling to your side will be easiest for most stomach sleepers. A dense pillow under your top arm will simulate the feeling of the mattress under your chest. If abandoning your cherished stomach sleeping position is just not feasible, try placing a pillow under your hips so that your back isn’t arched. Read More: Sleeping on Your Stomach: Make the Most of It! Side sleeping can help to relieve back pain for some. Back-sleeping, though not for everyone, can help as well. Are you already a back sleeper and you’re still experiencing back pain? While it’s touted as a great way to sleep, back sleeping can sometimes cause back pain as well. If that’s the case, try putting a pillow under your legs and/or stretching your hip flexors before bedtime. Otherwise, try rolling to your side. A new pillow can help improve your sleep posture. 2. It could be your sorry old pillow’s fault. If your pillow is too thin or soft, your back will bend downward at an awkward angle. Conversely, if it’s too thick, your spine might bend unnaturally upward. Both situations can cause pain. If your head is supported at the correct level, the muscles in your neck and back will be able to to completely relax. Pressure on your discs and muscles will be diminished and, as a result, your back pain reduced. Most of us westerners are acclimated to traditional “soft” pillows containing down or polyester fibers. 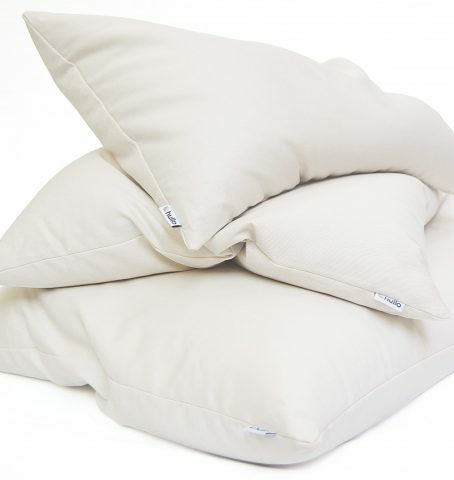 Traditional soft pillows will collapse under pressure and can not support your head adequately throughout the night. In fact, many find themselves using two pillows or folding their pillow in half in an attempt to support their head at the proper level. Fiddling with pillows in the middle of the night is not conducive to good sleep! We are huge fans of buckwheat pillows due to their adjustable and malleable nature. The buckwheat hull fill is really unique—it will perfectly conform to the space between your head and the mattress eliminating potentially pain-causing pressure points in your neck and back. Most buckwheat pillows are adjustable; you can add or remove fill to dial in the loft (height) so that your spine is straight rather than bent upwards or downwards. Your pillow is probably pretty nasty anyway! Toss it out and treat yourself to a new one. 3. Blame your expensive mattress. Like pillows, your mattress needs to provide support that conforms to your body. The right mattress will help you maintain proper sleep posture all night. Beware of the squishy pillow top mattresses! sagging and/or compressing over time from repeated use. Maybe your mattress is just too firm? If your mattress is too firm, it won’t compress sufficiently to allow your body to sink downwards in the appropriate locations. If you’re convinced that a new mattress is the key to eliminating your back pain, shop with caution. The large mattress manufacturers are frequently criticized for their marketing practices. They often distribute the same mattress under different names to each retailer intentionally making it difficult for consumers to comparison shop. Your best bet is to ignore the goofy marketing lingo and purchase whatever is comfortable and well-reviewed. Unfortunately it’s difficult to determine what’s genuinely comfortable with online shopping or even a short visit to a brick and mortar location. Ideally, you need to sleep on a mattress to truly know if it’s right for you. As it happens, many retailers now have generous return policies, making it feasible to try their products in your own home for a period of time. Before you make a purchase, make sure you understand the company’s return policy. But my back hurts after sleeping and I need relief right now! Stretch your back muscles. Hamstrings, quads and hip flexors can shorten while sleeping. The simplest remedy for immediate back pain relief is good old-fashioned stretching. This WebMD video demonstrates five simple back pain stretches. Take a long hot bath. The warm water will help increase circulation and is often effective in providing relief to stiff muscles. No time for a bath? Use a warm compress instead. A warm damp towel (use a microwave to heat it) can work as well or better than a hot bath. Beware, heat can make inflammation worse, so if your symptoms deteriorate, remove that heat immediately! Ice in short increments. It can work well for some, but cooling can aggravate some more serious issues, so if the pain worsens, remove the ice immediately. Have a partner massage the affected area. Who doesn’t appreciate a good massage? Back pain or not, it generally makes life in the moment a little better. Pop a few of what modern medication has to offer. Aspirin, acetaminophen, or ibuprofen can help a lot if the pain isn’t too ridiculous. It should go without saying, but please follow the directions on the packaging. Hopefully you’re able to pinpoint the source of your back pain and resolve it without too much inconvenience or expense. If your back pain isn’t specific to sleep and persists during the day, you most likely have a more serious issue that cannot be resolved with the suggestions above. Go see your doctor if you aren’t able to some up with working solutions of your own. Give Hullo a try for 60 nights. 11 Responses to My Back Hurts After Sleeping! What Can I Do About It? The best shift I made to help me get a better night sleep was having my last meal 3 hours before bedtime. I would get to bed with an empty stomach, but not feeling hunger pangs. It allowed me to fall asleep and stay asleep (and have a deeper sleep). Thanks for the post and tips! What does that have to do with lower back pain? You just have us your solution to falling asleep easier and staying asleep. I purchased a mattress from Mattress Firm for over $1000.00. Being that I purchased it off the show room floor, I got it for half the price (so they say). which means I cannot take the mattress back after 30 days. This mattress has caused me pain every morning from my neck down to my back. I am now stuck with this expensive mattress that I cannot use. Im in the same boat. We bought a new foam spring hybrid mattress for $1100 from VCF. They dont take them back after 7 days. Well who knows if a mattress is good in only a week. It takes time. Ive tried memory foam, a fiber bed, everything. My back is killing me every night/morning. I changed my pillow and with the fiber bed it has helped slightly but I have also been going to a chiropractor and my regular physician thinking theres something wrong with me but I think its the bed. You are not alone!!! Same thing happening to me here. We have the $2200 tempur pedic mattress and it is killing my back every morning. I used to love sleeping but now I am afraid to go to bed because knowing it the morning my back will hurt. When I visiting my parent’s house sleeping on them very cheap mattress but I actually sleep well with no back pain in the morning. I would never in my life buying an expensive mattress but the one that you are comfortable with. Sheri, I have the same exact experience. I feel your pain, literally. I wish I had my old mattress back?. Lower back pain in my case isn’t caused by the mattress. Check the bed Base! It *has* to be completely flat and solid. I have the same problem and I blame it on the euro-top mattress. I don’t even know why they call it Euro. I am from Europe and I never saw such a mattress. I slept best on the tight top, as they call it now, mattresses. And since when did they stop making it a fake bottom instead of the same all over? I can’t even flip it. I hope this cheap cheap fake mattress North American fad fades away because apparently I am not the only one who is suffering with these types of mattresses. It is not normal for my waist down to my hips to sink downward. This is not acceptable. I wake up a million times in the night and I have neck and upper back pain. I want the old fashioned mattress and the ones called posturepedic which were more expensive but still had the tight top.